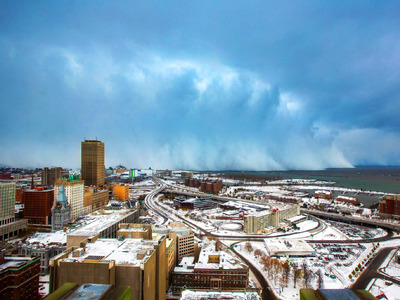 REUTERS/Lindsay DeDarioStorm clouds and snow blows off Lake Erie in Buffalo, New York. Central Banks provided some “oomph” to the markets, sending stocks to record highs. 1. Before settling down a bit, the Dow surged 175 points to set an intraday high of 17,894.83 earlier today. The S&P 500 spiked 18.7 points to set an intraday high of 2,071.46. 3. China’s Central Bank sent shockwaves around the world when it unexpectedly announced its first rate cut since June 2012. The one-year deposit rate just got cut 0.25 points to 2.75%, and the refinancing rate was slashed 0.40 points to 3.60%. This was seen as an effort by Chinese policy makers to stimulate the decelerating economy. 4. But, at least one economist isn’t so bullish about the rate cuts. “I think the market is somewhat overreacting,” Societe Generale economist Wei Yao told Business Insider.